Bus from Johor Bahru to KL is the key transportation to connect the two largest cities in Malaysia. Thousands of commuters travel daily between the two cities. Besides that, to save cost, many travellers from Singapore also travel to Larkin Bus Terminal in Johor Bahru to take a bus to KL. To meet the demand, there are various bus operators providing bus services for this route. Some of the famous bus companies that provide daily buses from Johor Bahru to KL are KKKL, Konsortium, Transnasional, LA Holidays, Meridian Holidays etc. How to Save Cost by Boarding at Johor Bahru instead of Singapore? The standard bus fare for a bus from Singapore to KL is SGD 30, whereas the standard bus fare for a bus from Johor Bahru to KL is RM35. One could save about RM55 or SGD18, considering the exchange rate of Singapore Dollar to Malaysia Ringgit is about 3.0. After understanding the saving model, another question is how one goes from Singapore to Johor Bahru Larkin Bus Terminal. The simplest way is to take MRT to Kranji station. Then at the bus stop just outside Kranji MRT, you can catch the bus 170 or Causeway Link CW2, and both coaches will take you to Larkin Bus Terminal at the cost of SDG 1.30 or RM 3. Please note that the duration from Singapore to Johor Bahru Larkin Bus Terminal will take about 1 hour, depending on traffic conditions. One should plan the schedule properly so that he/she can check-in 30 minutes before departure. Another point to take note of is that many ticket touts are in Larkin Bus Terminal soliciting customers. If you are approached to buy a ticket, you can politely inform them that you have booked your ticket online. They will not bother you any longer and will let you go. Therefore, it is advisable to book tickets online in advance or buy bus tickets directly from the counter. The standard bus fare for a bus from Johor Bahru to KL ranges from RM 25.00 to RM 40.00. During festive seasons like Chinese New Year or Hari Raya, the bus fare may go up. The duration for the bus from Johor Bahru to KL usually takes about 4 hours with 1 washroom break provided. Some coaches will stop at Yong Peng food court for washroom break and meal break. Therefore, please check for your choice before purchasing your ticket. The earliest departure time for a bus trip from Johor Bahru to KL is at 6:30am, while the last bus departs from Johor Bahru at 1:00am. There are a lot of departures scheduled daily, which is very convenient for travellers. All coaches from Johor Bahru to KL terminate at Terminal Bersepadu Selatan (TBS), the newly built bus terminal at Bandar Tasik Selatan. Passengers who want to go the city centre need to transfer LRT next to TBS. Here is the guide. 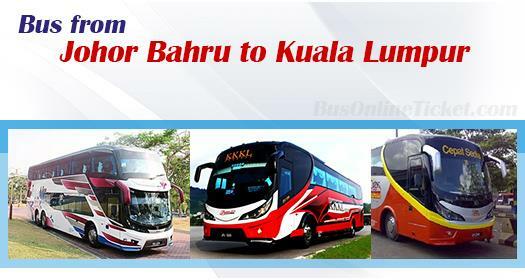 Booking Johor Bahru to KL Bus Ticket at BusOnlineTicket.com is secure and simple. As long as you have Internet access, you can make online bookings at BusOnlineTicket.com anywhere under the sun. You not only can book Johor Bahru to KL Bus Ticket, but also other bus tickets within Malaysia.